Danny Dorling brings a geographer’s eye to the study of inequality but is never overly wonky, writes Sarah Sackman. 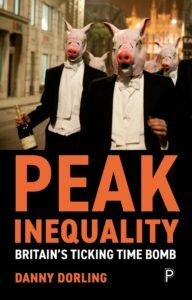 Inequality is the key political issue of our time and in this book, Danny Dorling consolidates his status as one of the most important scholars of inequality in the United Kingdom today. Since the 2008 crash increasing evidence has emerged of the damaging societal effects of inequality. Dorling’s work takes its place among books such as Richard Wilkinson and Kate Pickett’s The Spirit Level, Thomas Picketty’s Capital and Michael Marmot’s The Health Gap, which explain how less equal societies are less trustful, less safe and less healthy. Dorling contributes a geographer’s perspective to the debate. Whether writing about the 2011 London riots, parliament’s location, or the allocation of infrastructure spend, Dorling shows “there is a geography to everything about politics”. Through his cartography, Dorling challenges us to think about inequality spatially, reflecting a society in which the rich distance themselves, in every aspect of life, from the poor, whilst simultaneously making poor people poorer. This book will feel familiar to fans of Dorling’s work. It combines new material with a selection of his writing which has previously appeared in journals and newspapers. As a result, chapters are short, packing the sort of thought-provoking punch you would expect from an op-ed. The upside is that each chapter is pithy, standalone and makes an argument, the downside is that the material sometimes fails to flow as a single coherent work. Yet Dorling’s overarching theme remains clear: the United Kingdom has reached a watershed of inequality, the highest of anywhere in Europe. And unless we agitate for radical change, we should not expect an end to extreme inequality. “We are now at the peak and starting on our way down. It’s a long way down”, Dorling writes. Despite being packed full of data tables and graphs Dorling’s writing is never overly wonky. The best parts of the book chart the unexpected connections between inequalities. In a chapter entitled “London and the English desert”, for example, Dorling compares maps of Arts Council funding, English housing wealth and distance from nuclear power stations. Each map looks remarkably similar, suggesting the geography of inequality pervades every aspect of cultural and economic life. The chapter on housing inequalities resonates with my own experience as a public lawyer and housing campaigner. Dorling’s assessment that housing has become the defining political issue of our time is spot on and his descriptions of British segregation through housing, the rise of renter and rentier classes, and his reminder that buying a home has always been hard except for a single golden generation lucky enough to buy between the early 1980s to mid-noughties, are excellent. Dorling is refreshingly passionate about his leftist politics. He cannot resist taking personal potshots at Thatcher, Cameron and Blair (saying of Thatcher she married “for financial advantage” and “died all alone” in a posh hotel). Whilst these will no doubt delight a left-leaning readership, they can sometimes seem gratuitous, distracting from the otherwise persuasive argument which could, and perhaps should be targeted, as much at those in the political middle ground who need to be convinced of the need for radical measures to tackle inequality. That’s important because as Dorling himself acknowledges, even if inequality has peaked, it can only begin to be addressed if we take bold steps to change things. Diagnosing the problem is one thing, tackling it is another. I wish the book had offered more concrete policy ideas for addressing the inequalities it superbly describes, but that is not Dorling’s project. Instead his call is for a broader democratic socialist revival. He argues in his final chapter (based on an article written before the 2017 election) that under Corbyn (someone he describes admiringly as a “listening man” who is “not in it for the money”) the Labour party, “represents a set of beliefs whose time has finally come”. Is he right? Certainly Dorling’s thesis that inequality generates grievances which drives people to support more radical politics rings true. Labour’s 2017 manifesto signalled a leftist social and economic agenda which was capable of inspiring millions. Yet the same grievances about inequality can equally be seen as fuelling the referendum result and contributing to rise of a populist right. Dorling is surely right that extreme inequality will define our politics in the coming decades but predicting exactly what comes next is a fool’s game. Sarah Sackman is a public law barrister and member of the Fabian Society executive committee.